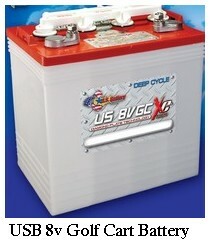 Wondering whether you should you go with the 8 volt golf cart battery for your conversion, or another voltage? There are reasons to choose 8 volt batteries, and situations where 6 volt or 12 volt golf cart batteries are better. When I say golf cart batteries, I mean lead acid batteries of a certain type best for golf carts, and they're the type folks are using in their electric cars, too. Your electric car's motor type, your initial vs. long-term budget, and your car's weight will be the main considerations in this decision. I'll talk more about that in a minute. Note: This discussion only applies to lead-acid batteries. LiFePO4 EV drivers say that you're using lithium, they've noticed that motor type seems to be much less of an issue. Less initial cost. If you're operating on a shoestring, this might make the difference between getting your electric car on the road......or leaving it, nearly complete, littering up the garage and irritating the spouse. Nobody wants that! Lighter weight. Typical car-load of 8-volt golf cart batteries will weigh 1000-1200 pounds, rather than 1200-1600 pounds if you use the same overall voltage of 6-volt batteries. For example: Powering a 120 volt system means using 20 six volt batteries, or 15 eight volt batteries. Fifteen 8v batteries weigh less than 20 6v golf cart batteries, overall. If you're pushing your weight limit already, this may be a consideration. Shorter life. Amp hours are heavy, and deep-cyclable electrode plates are heavy; since the amp hours in an 8 volt golf cart battery are about the same as their 6 volt counterparts (although see next item on the list! ), this can only mean that the electrode plates are somewhat less sturdy...which means you can't charge and discharge them as many times as their six volt cousins before they refuse to recharge again. This is the cycle life of a battery, and in general, the cycle life of an 8 volt golf cart battery is shorter than that of a 6 volt golf cart battery. Range is shorter. Since lead is fuel, and it's heavy, it follows that less weight means less lead...and less lead means less miles. And the 8 volt batteries can be drained faster by a lead foot than the 6 volt variety. And the 12 volt golf cart batteries, you ask? ...but lightest weight of all the lead golf cart batteries. The "Lead Foot Factor" I just mentioned becomes a REAL issue with 12 volt batteries. These are usually reserved for either AC drive systems, which use lead batteries more conservatively, or EV racers who are simply looking to pour as many amps into their electric motors for the quarter-mile as quickly as possible and don't care much about range. NEDRA EV racers are mostly using lithium these days, though, since the price has come down. 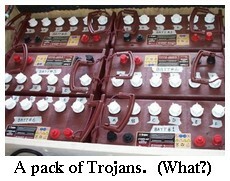 Two major brands of 8 volt golf cart battery dominate with respect to EV popularity: Trojan, with their most popular T-875, the leader by far, and their T-860 (less AH) and T-890 (more AH); and US Battery with their 8VGC family. Trojan T-875 8 volt golf cart battery These don't come in the preferred L-terminal type, so be aware of this before you decide on an 8-volt battery format. Dimensions: 10 3/8 in. x 7 1/8 in. x 10 7/8 in. The Trojan website isn't too forthcoming with cycle life information for these (I got "650 cycles" from a discussion on the EVDL), nor rate of discharge at 75 amps (which is the rate that matters more to EV drivers). The US Battery 8VGC comes in three flavors, depending on the number of amp hours you want. More amp hours means more lead, so the higher the AH, the heavier and more expensive they are. Dimensions: 10 1/4 in. x 7 1/8 in. x 11 1/4 in. 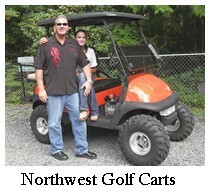 I called up the owner of Northwest Golf Carts, Inc. in Seattle this morning to ask him a few questions about the different 8 volt golf cart batteries available for sale and the pros and cons of the different types. not letting them drain down too far. Lead-acid is too stupid to have a memory, so you don't have to let them drain every once in a while like you should with ni-cad batteries. The Trojans cost a lot because of their name, he said, but USB's are just as good and cost a little less. He said that Trojan doesn't honor their warranty as religiously as US Battery, and this is a good enough reason to get the US Batteries instead. US Battery is great with their battery warranty. Exide batteries are cheaper than the Trojans and US Battery 8 volt golf cart batteries, so a lot of folks are tempted to buy them to save money; but in the NW Golf Carts, Inc. owner's opinion, it's a waste of money. You get what you pay for. He says that Sears, Les Schwab, and Napa all market Exide batteries under their own brand, but they are just as...cheap, shall we say? as the ones with the Exide label. What about Interstates, I asked. He said, "Those ARE US Batteries. Go ahead." Have A Question About Electric Car Batteries? Do you have a question about this? Ask it!